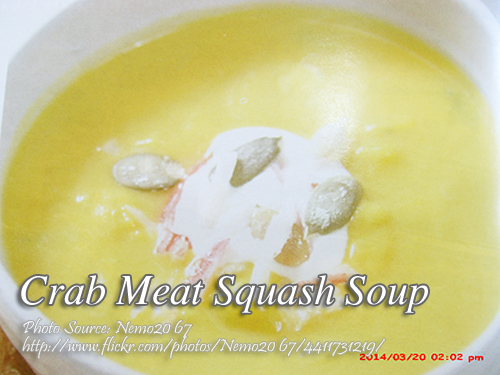 Crab meat squash soup is a combination of squash and crab meat made into a creamy soup. Can be eaten as an appetizer or can be serve in breakfast with buttered garlic bread. When choosing squash, look for a young squash with green peel and bright yellow flesh because it is sweet and tender. The color is also more appetizing than the yellow orange flesh. To make crab meat squash soup; Peel and dice squash and boil in water until tender. Drain and mash the squash. Set aside. Heat butter and saute garlic until fragrant but not brown. Add celery and stir cook until tender. Stir in white wine, if available. Cook over low heat until most of the wine has evaporated. Add mashed squash and chicken broth. Bring to a boil while stirring occasionally. Add in crab meat and stir cook for a few minutes. Then stir in evaporated milk, sugar, salt and pepper. Reduce heat and simmer for 5 minutes. Add in all-purpose cream and heat through. Serve hot with a garnish of chopped parsley and nutmeg if desired. To see the complete recipe with list of ingredients in exact measurement, continue reading. Peel and dice squash and boil in water until tender. Drain and mash the squash. Set aside. Heat butter and saute garlic until fragrant but not brown. Add celery and stir cook until tender. Stir in white wine, if available. Cook over low heat until most of the wine has evaporated. Add mashed squash and chicken broth. Bring to a boil while stirring occasionally. Add in crab meat and stir cook for a few minutes. Then stir in evaporated milk, sugar, salt and pepper. Add in all-purpose cream and heat through. Serve hot with a garnish of chopped parsley and nutmeg if desired.